For this week’s vase, my spouse requested a “tall” arrangement and I’m happy to oblige. I’ve chosen our tallest vase, a sleek, black glass in the Ming-style, that was a gift from his brother many years ago. Curiously, when held up to the light, it’s actually amethyst-purple, a trick of the eye. Although the scale may be hard to detect from the photos here, this arrangement stands four feet tall. My theme is that of a golden, summer meadow. 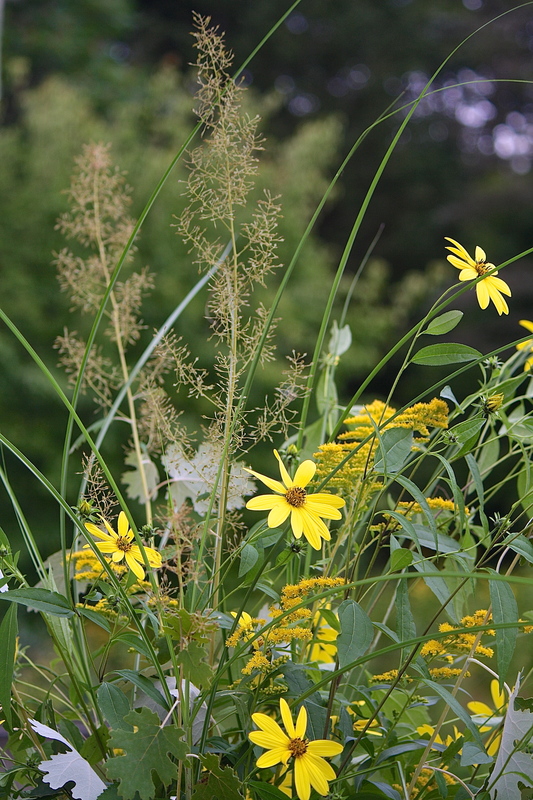 I’ve used bright yellow daisies of woodland sunflower (Helianthus divaricata) and wild goldenrod (Solidago sp.). Plume poppy panicles (Macleaya cordata) provide vertical accent and the fig-shaped leaves show fuzzy, white undersides, as if blown by the wind. Arching blades of grass (Miscanthus sinensis ‘Sky Racer’) add to the feeling of movement, as well as the wild meadow look. 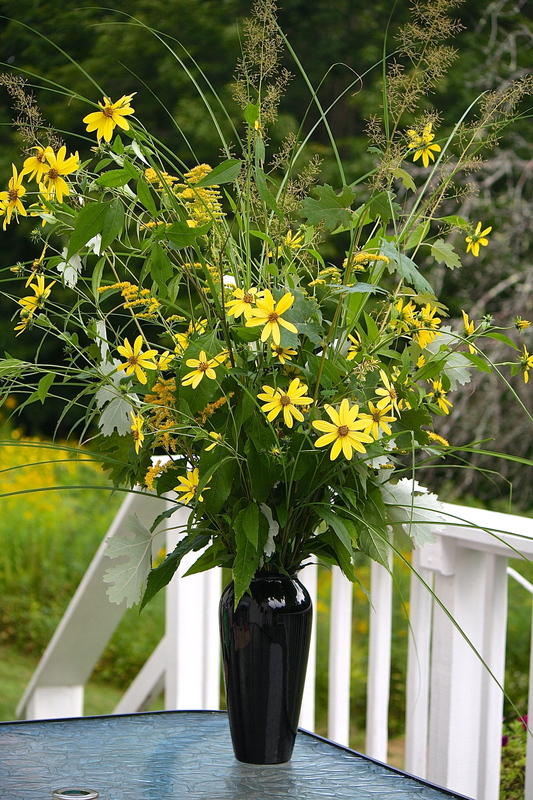 This entry was posted in Country Gardening, My Photos and tagged flower arrangement, flowers, gardening, gardens, goldenrod, In a Vase on Monday, meadow, meme, miscanthus grass, photography, plume poppy, summer, Weekly Vase Challenge, woodland sunflower. Bookmark the permalink. Oh that is beautiful!!!! 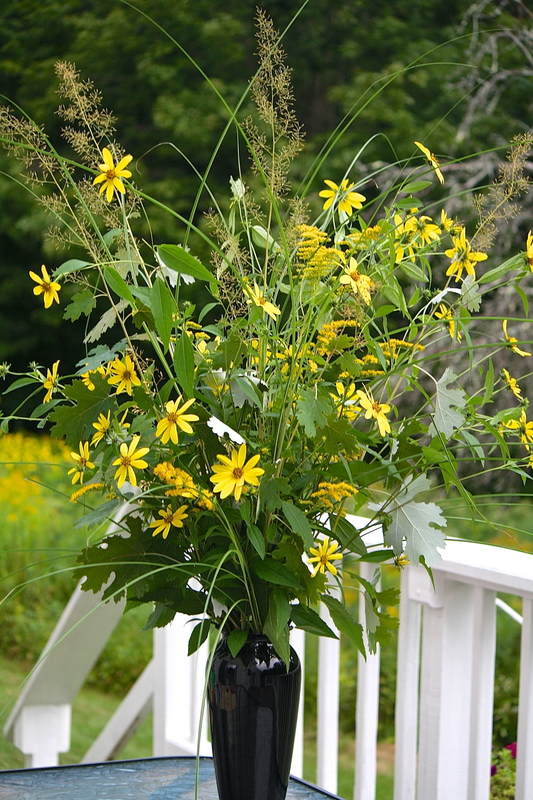 love the dark with the yellow:-) Good to see someone honor goldenrod in a vase! 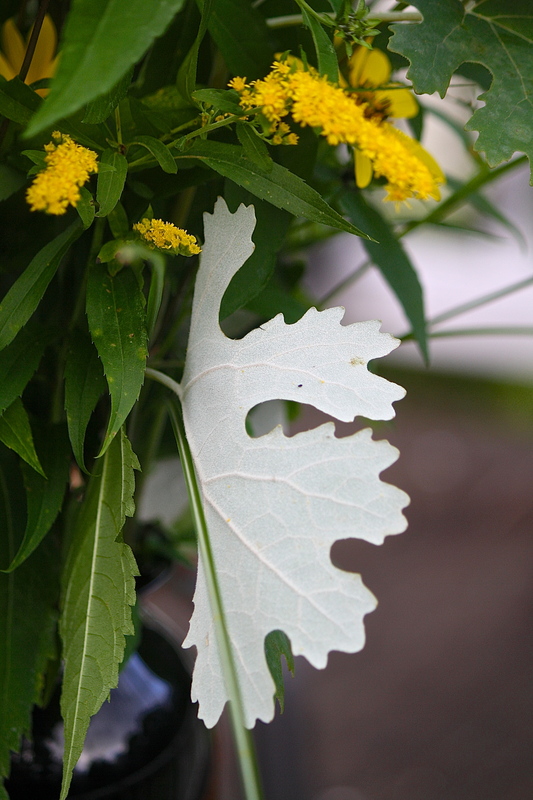 Great plant for a garden. Thanks, Robbie, I have bushels of goldenrod! Good thing the pollinators love it. I hear the pollen is a very good source of protein. Tall, dark and stunning in its own sunshine way! Wow! This is one impressive Vase on Monday. I’m not sure if it’s my most favorite, but it’s high on the list…which goes well with its literal stature. So inspiring. Thank you for sharing. That’s a stunning vase of flowers. Absolutely beautiful. I have tall flower envy now! Beautiful as usual, Eliza. So nice. Perfect. I hope you’ve had lovely sitting outside weather to enjoy it. My goodness this is a beautiful tall vase of one of my favorite flowers…mine are just starting to flower. I’m sure that your spouse was more than happy wit the arrangement. I can “see” it in place of honour on small table in front of my dining room window! Yes! ALL four plus feet of it! Beautiful! I LOVE BIG TALL arrangements! I actually have one of my own because I had to clip some Helianthus Microcephalus away from the door so we could get in and out of the workshop. It’s becoming difficult to move around the garden! Very pretty vase. 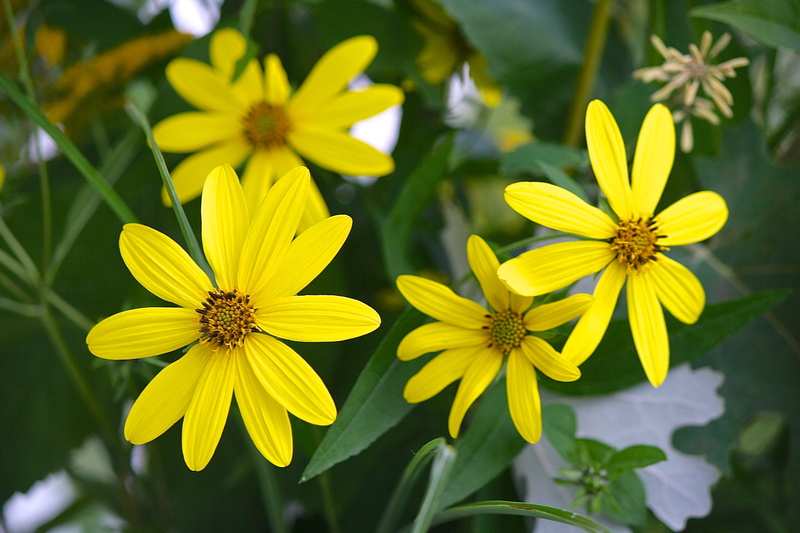 I am a huge fan of hte woodland sunflower. You’ve showcased it beautifully!